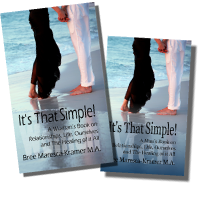 Relationship Help Book For Couples | Relationship help and Dating help Coaching by Expert Bree Maresca-Kramer M.A. If you are facing problems in your relationship and need help the great news is you have found it! Everything you need to know to heal and transform your relationship is in It’s That Simple! After years of counseling men and women I absolutely knew I had to write a separate book for men and women! Primarily because men and women are so very different in the way we think, feel, process and apply information. Due to this fact, I wanted to provide men the help they needed and women the help they needed to have the best relationship they could. Everyone is well aware of the fact that communication is key in a healthy relationship. However, most do not understand that unless a man and woman know how to communicate effectively with one another they will face multilevel of difficulties in their relationship. You can have the deepest love along with the best intentions, however, if you do not know how to effectively get your message across to your partner and how to listen to your partner the relationship will have problems. How To Communicate In A Way That Really Works! How To Build A Healthy Relationship! How To Heal Old Wounds That Are Harming Your Relationship! How To Create A Deeper & Stronger Bond! How To Have A Great Emotional & Physical Intimacy! How To Change Negative Thinking That Is Hurting Your Relationship! How To Fully Understand Your Partner & Their Desires From You! How To Discover, Accept, & Love Your Partner & Self In A Whole New Way! Being in a relationship that is not working is extremely painful and damaging to your emotional, physical, and mental well-being, therefore, it is very important to heal the problems as quickly as possible.